Carrot Halwa and Beetroot Halwa are my favorite recipes when it comes to sweet. I have them with Vanilla Ice Cream. My mom makes Beetroot Halwa very often. I have seen my friends making a blend of Carrot Halwa and Beetroot Halwa. Carrot and Beetroot Halwa combination also tastes great. Last Friday morning, Gj had a craving for Carrot Halwa. I was surprised…you know why? That’s because he is never fond of sweets. I wanted to surprise him that evening. When I was thinking of trying something different, my friend suggested me this recipe. 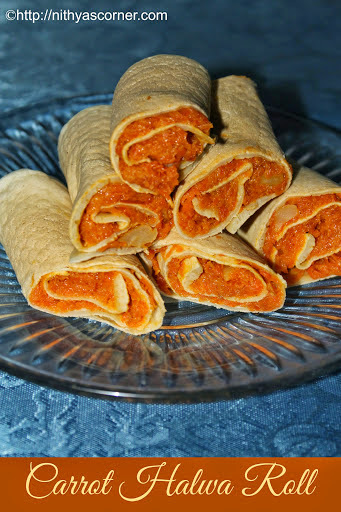 I have not heard of Carrot Halwa Roll before. My friend gave me this recipe, and said she found it in “The Hindu Website”. I tried it out and came out well. The recipe had directed me to make thin pancakes but when I made them, it was quite difficult to roll. The pancakes gave up easily. I then made pancake of medium thickness and tried to roll them. It came out easily. It was nice to eat Carrot Halwa this way and filled our stomach well. 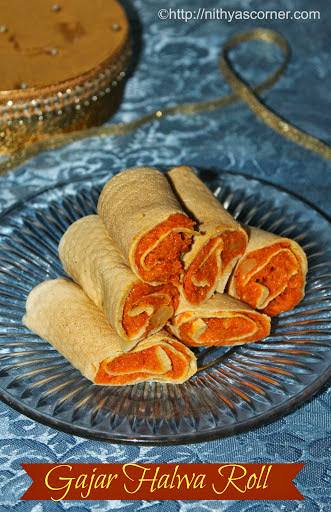 Next time when I have guests at home, I am going to surprise them by serving Carrot Halwa Roll. So who is going to me by next guest???? Carrots – 6 medium-sized nos. Chopped Cashew Nuts – 10 nos. 1. Wash the carrots and trim their edges. Scrape the skin for all the carrots. Use the small blade in the grater/mandoline to grate the carrots. 2. In the same pan, add grated carrots and sauté well. Keep stirring continuously until carrots shrink in size, turn pale and smell sweet. The raw smell of carrots should go off completely. If not, your carrot halwa will taste raw. 3. Now add milk (carrots should be submerged in the milk) and let the carrots boil in milk for sometime. 4. When the carrots have boiled and absorbed by the milk well, add sugar. Stir well. The mixture will liquefy and then again start thickening. Boil for some more time until the mixture thickens and leaves Ghee on all sides. 5. Meantime, fry the cashew nuts in a teaspoon of ghee until golden brown. When the mixture becomes like a thick mass, add the fried cashew nuts and stir once for the last time. Now Carrot Halwa is Ready! Now let us see how to make Carrot Roll Halwa. 1. For the pancake, prepare a batter with the ingredients listed and rest for 10 minutes. 2. Using a non-stick pan, prepare medium thickness pancakes, cook on both sides, and remove. Cool the pancake. 3. When the pancake cools down, stuff the pancake with the cooled halwa, roll and slice. You can add khoya or 1 tablespoon of paneer along with sugar to the carrot halwa. Khoya will give richer taste. You can also add pistachios or almonds instead of cashew nuts. Grating the carrot takes some time. To reduce the time, you can use food processor instead. Saute the grated carrots well before adding the milk. The raw taste of the carrot should completely go off if not the halwa will taste raw. You can also add raisins along with cashew nuts. You can also decorate with silver warq. You can also add a pinch of edible camphor. Do not make thin pancakes as it will break while folding. The pancake hardens or cracks as time passes by. 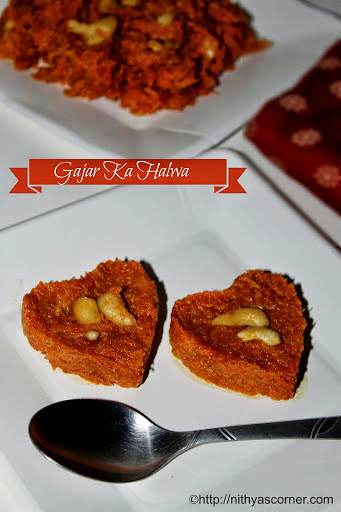 This entry was posted in Others and tagged Carrot Halwa on November 22, 2014 by vikashbhardwaz. My mom makes a variety of dishes with the mixture combining coconut gratings, jaggery and cardamom powder. Several dishes can be made with the coconut-jaggery-cardamom mixture. Some of them are Sural Appam, Suzhiyan, and Modak etc. I like the mixture, but am not very fond of this. On the other hand, my mother loves it. She likes to try out various recipes using this mixture. She’ll make a large batch of this mixture and will make two to three dishes on the same day. My mom wanted me to post this Kerela/Sri Lankan recipe in my blog. I learned this recipe from my mom. It came out very well. This recipe is very simple and easy to make and would taste more like Suzhiyan. If you are a person who likes sweet, you will definitely like this dish. 1. 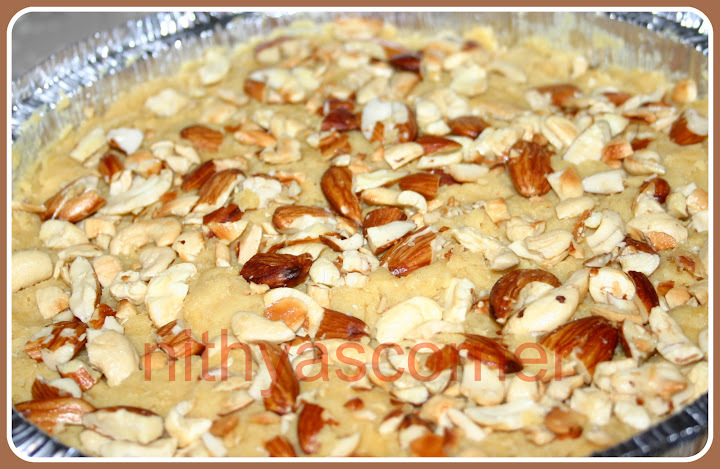 In a heavy wide-bottomed pan, add jaggery and water. Boil well. 2. Once the jaggery dissolves completely, add the coconut gratings. Simmer the flame and stir well until the mixtures become thick. Then switch off the flame and let it cool down. 3. Take little mixture on your palm and roll them evenly to form tomato-sized balls. In a mixing bowl, combine All Purpose Flour (maida), cardamom powder, and salt. Then add water little by little to form batter. 4. The consistency of the batter should be like Bajji batter. Coat the balls in the All Purpose Flour mixture. Heat oil in a frying pan. The oil should be medium hot. Then deep fry the balls in the hot oil. 5. When the balls are fried on one side, flip them over and fry them on the other side also. Once the balls turn golden brown, take them out and drain them in a tissue paper. Now, Coconut Sweet Balls are ready! 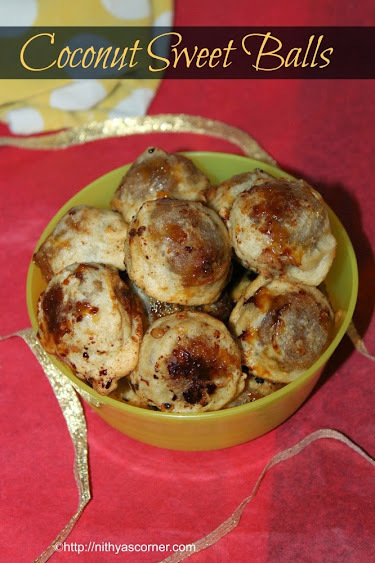 This entry was posted in Others and tagged All Purpose Flour, Cardamom powder, Coconut, jaggery, Recipe on November 22, 2014 by vikashbhardwaz. 1. In a mixing bowl, put wheat flour, salt, and sugar. 2. Add 1/4 cup of water little by little and make a soft and pliable dough. Cover the dough and set it aside for 10 minutes. 3. 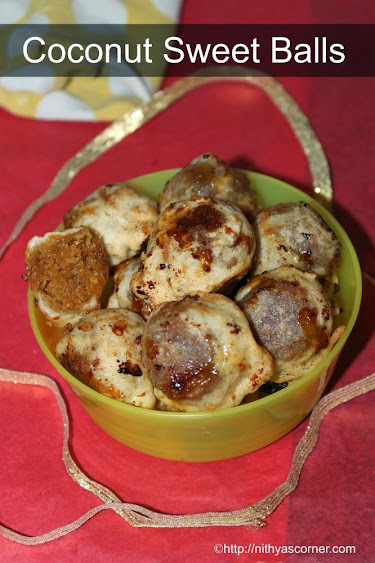 Make small smooth balls out of the dough. The size of the ball should be that of a table-tennis ball. 4. Roll out into thick-thin circles usually smaller than the size of Chappathi. (It should neither be too thick nor too thin). Now, fold the puris twice to form a right angled folded structure. (I have folded it twice). 5. Heat oil for frying the puris on medium heat. Allow it to heat well. To check the oil heat consistency: Drop a tiny bit of dough in the oil. The tiny bit of dough should immediately pop out after getting fried. This is the correct consistency of the oil. Instead, if the dough remains at the bottom,then the heat is not enough. 6. Now, gently slide in the puris from the side. The puris will settle at the bottom for few seconds and then it would float in the oil. 7. When the puri floats, gently press its one side using the ladle. This will cause the puris to puff up. 8. Once the puri is cooked on one side, flip the puri and cook the other side also. 9. Scoop the puri and drain it on a paper towel so that excess oil comes off. 1. In a heavy bottomed pan, dissolve the sugar in the water and bring it to boil. 2. Keep boiling the syrup. The sugar will be dissolved completely and at a point, you will get a drop of syrup that will leave a string (like one line) between your thumb and finger. This is one string consistency. Keep it aside. Now, put the puris into the sugar syrup and set it aside for 15 minutes. Once the puris are cooled down, serve them. 1. Allow the puris to cool down before you taste them because it would be too hot and you would also end up burning your fingers and tongue. 2. Shelf life is 4 days. 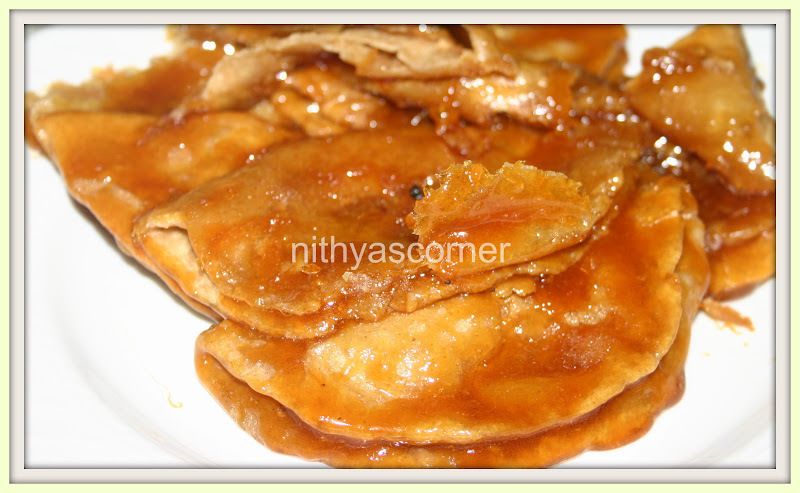 This entry was posted in Others and tagged Krishna Jayanthi, Makmal Puri, Sugar Syrup, Thirugnanam Thirunavukkarasar on November 22, 2014 by vikashbhardwaz. My cousin likes Shrikhand a lot. When I was young, we used to dine in her favorite restaurant where they make tasty Mango Shrikhand. I tasted the Mango Shrikhand for the first time there and fell in love with it. 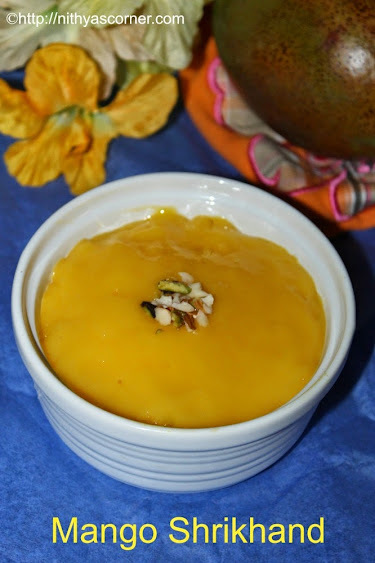 Mango Shrikhand has a creamy flavor and it is hard to resist for me. Saffron Strands – 2 to 3 nos. 1. Place the curd/yoghurt in a muslin cloth and hang it until the whey/water is drained completely. It would take about 30 to 40 minutes. 2. Meantime, add the ripe mango pulp to the blender and grind until smooth. Once the whey has drained out completely, transfer the hung curd to a mixing bowl. 3. Add boiled milk to the curd and whisk well until smooth. To it, add the mango pulp, cardamom powder, and sugar. Stir well. 4. Add saffron strand and give a quick stir. Make sure Mango Shrikhand does not have lumps. Garnish with almonds and pistachios and serve. Now Mango Shrikhand is ready! Refrigerate for an hour and serve chill. You can use store bought mango pulp too. I have added boiled milk because my hung curd/yoghurt was thick. Adding milk is optional. 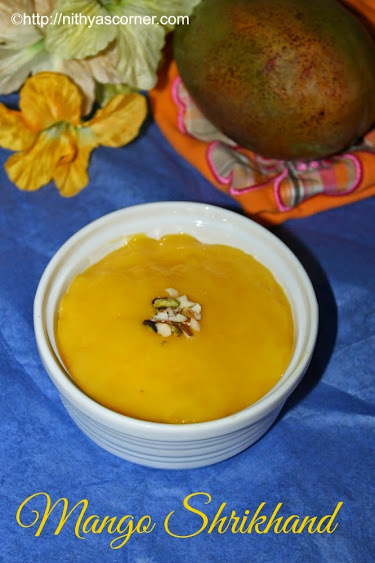 Sweet mangoes are best to make Mango Shrikhand. You can use chiroli nuts which is generally used for Mango Shrikhand/Amrakhand recipe. Stays well for a day or two if refrigerated. This entry was posted in Others and tagged Mango Pulp, Mango Shrikhand on November 22, 2014 by vikashbhardwaz. Rich sweet with only four ingredients! 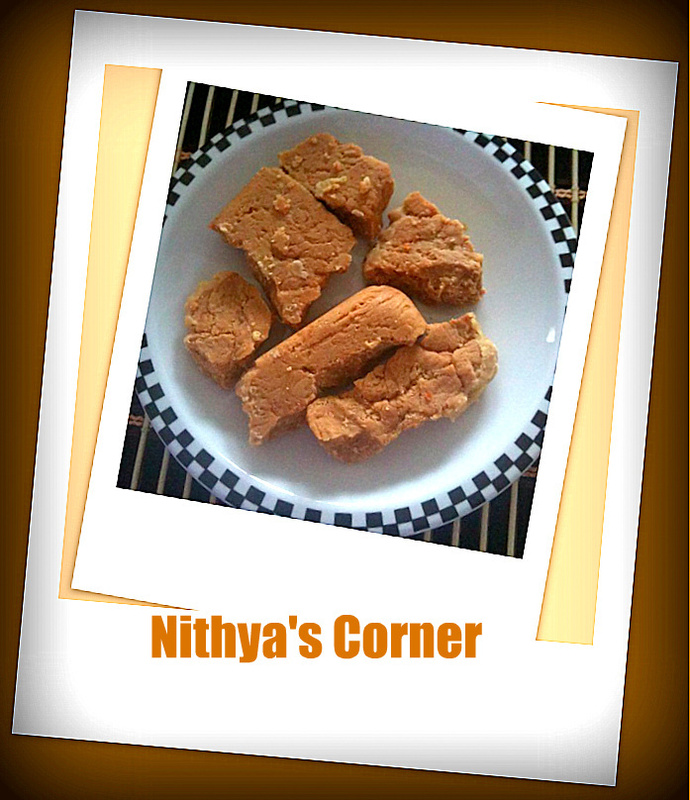 I learned this recipe from my friend who loves Mysore Pak and made it for Diwali 2010. In general, she makes delicious sweets. I made the Pak in less than 10 minutes and never knew that it was damn easy to make. I literally jumped out of joy. If you want to have the exact taste of Krishna Sweets (I am a big fan of Krishna Sweets Mysore Pak), thumb rule is add lot of ghee. How much ghee should you add???? Triple the times!!! Even more…! Sometimes, I wonder about this sweet’s name…is it Mysore Pak or Mysore Pa? Some people call it as Mysore Pak and some as Mysore Pa. I prefer to call it as Mysore Pak, as I have always heard the name of this dish by that way. I still remember when I was 6 years old, I attended my uncle’s wedding. They had a big container full of Mysore Pak. I tasted it and instantly fell love with the sweet. My mom gave me 5-6 Pak and asked me not to have more. More than her advice, I liked the sweet. I had lots without her knowledge and guess what??? I had so much that I did not want to have it at least for the next 5-10years. I had So MuCh!One thing that I should not forget to tell you is DO NOT OVERHEAT the Pak otherwise you would lose the consisteny and it will become very hard. Do not get disappointed if it does not come out well for the first time. Learn where you went wrong and try for the second time. I am sure you will get the desired taste and consistency. Switch off immediately when you get the bubbles. Do not heat it even for extra 2 seconds. It will only harden the Pak. 1. In a bowl, melt ghee in a microwave for one minute on high. 2. Now mix all the ingredients in the melted ghee. Mix well. 3. Important Step: Microwave the mixture for three minutes. Remove the mixture in between and mix well. Do not forget to mix well in between. You can see bubbles forming on the mixture. This is the right consistency. Do not keep for any extra seconds. It will change the taste. When you see the bubbles, stop heating further more. 4. Now remove and mix nicely and pour over a greased plate. After 10 minutes cut into pieces. Remove after it cools completely. Now, Microwave Mysore Pak is ready!!! This entry was posted in Others and tagged Krishna Sweets, Krishna Sweets Mysore Pak, Mysore Pa, Mysore Pak on November 22, 2014 by vikashbhardwaz. Mohan Dhal is a Gujarati Sweet. Initially, I learned the Mohan Dhal recipe from a tamil tv channel. I wanted to try it out but did not have time at all. After few days, I wanted to make some sweet for one of our close friend’s babyshower(Seemantham). On the day before the babyshower, at midnight 1am (didn’t find time at all to make it during the day time), I made this sweet. I asked my husband to taste it. He liked it and appreciated me. I would rate my sweet say 80/100. I was not completely satisfied but then I thought it was okay. I decorated the sweet well and gave the sweet along with a greeting card, gift card, and some fruits. Some of the friends who had come for the babyshower appreciated me for the presentation part. I felt very happy that day. I kept the remaining sweets in the refrigerator. After two days, my husband asked me for the sweet. When I gave him the sweet, he immediately starred at me and said this was the worst sweet he had ever had in his life. Immediately, I tasted it and did not like it at all. I was not even able to swallow the sweet. I felt so bad and disturbed. I was pondering how could I ever make a sweet like this and give it for a baby shower…I felt so bad on my part. Now, nothing can be done. All I can do now are only two things: make another sweet for the same friend and apologize and learn from my mistake. So, what did I learn? Never blindly follow a recipe at the last minute how much ever nice it looks. After few days, I tried making the same recipe with few changes to the original recipe and vahrevah….it came out well. If you ask me if I had given the sweet to my friend, no…no…no way…… I should make another sweet for her. I do not want to frighten her by giving the same sweet. Though the recipe ingredients and method had been changed, the sweet’s appearance remains the same. So, now you can make this recipe and let me know your experience! 1. Warm 1 tablespoon of Ghee in a nonstick pan. Fry besan flour until you get good smell. Remove besan flour and transfer it to a mixing bowl. 2. Now, when the besan flour is warm enough, add milk and stir well. Then, add desired quantity of water in such a way that the besan milk mixture becomes a thick paste. 3. In the same nonstick pan, add 1 tablespoon of remaining Ghee. Fry cashews and Almonds (Badam) till they become golden brown. Transfer them to a bowl. 4. Now, add the besan milk mixture to the pan and fry well. Slowly, add the condensed milk, sugar, and vennila essence and again fry well until the raw smell of the besan mixture goes off and also until there are no lumps. Put saffron strands on top. Switch off the stove. 5. Apply Ghee on the bottom of the desired plate. Using a spoon, put the Mohan Dhal sweet on the plate and press well. Put some fried cashews and Almonds (Badam) on the sweet and gently press them. Allow the sweet to cool and then cut the sweet into desired shapes. Now, the Mohan Dhal sweet is ready! Store it in an airtight container and refrigerate for 2 weeks. This entry was posted in Others and tagged Mohan Dhal on November 22, 2014 by vikashbhardwaz. 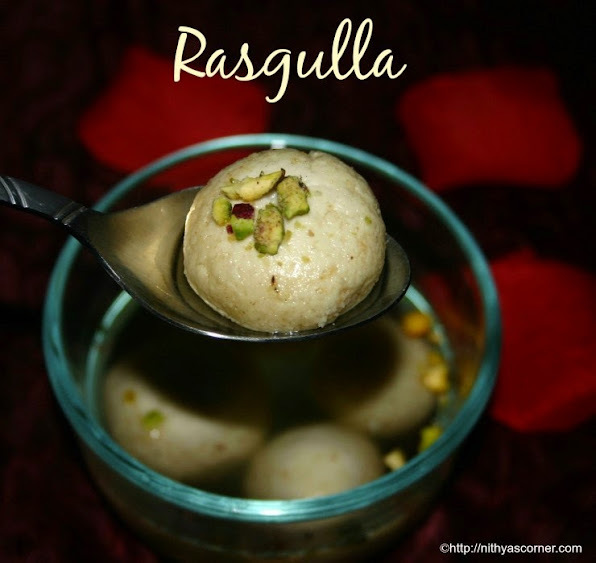 I would always think Rasgulla is so difficult to make. My friend always encourages me to try Rasgulla once and see how easy it is. Then I decided to give a try. Once the paneer is ready, you can make the Rasgullas in no time. You just have to pressure cook the paneer balls using sugar mixture. It taste so good. I wanted to surprise Gj when he comes back from office. I made the paneer in the morning and in 30 minutes, I made Rasgulla. Gj simply loved it. 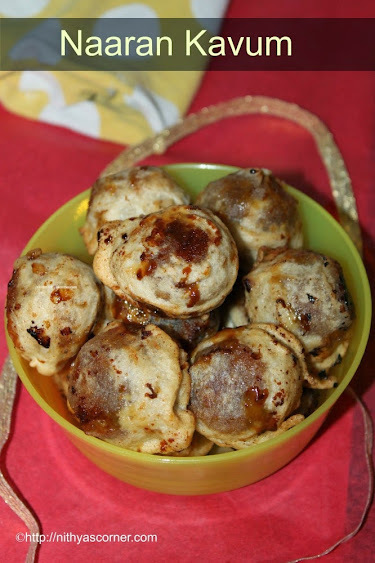 Try this yummy sweet for Diwali and you’ll love it. Yield. Paneer from 8 cups of milk will make about 15 to 20 Rasgullas. In a heavy bottomed pan, set the milk up to boil over medium heat. Stir occasionally and make sure not to burn the milk. When the milk comes to a boil, sim the fire and pour the curd gradually into it and keep stirring. Reduce the heat and stir continuously until the milk completely separates into curds and whey. If it doesn’t seem to be separating completely, add another tablespoon of curd. Once the milk starts curdling, you will see a light yellowish whey along with the curdled milk. If the milk has curdled completely, stop adding curd. Remove from the heat when the separation of the curds and yellowish whey is complete. Let it sit aside for 10-15 minutes. Do not stir it. Now it is time to strain the milk. Place the muslin cloth over a colander or strainer. Rest the colander over a large vessel. Now, strain the curdled milk through a clean muslin cloth. Then, hold it under running water for a minute so that the smell and sourness of the curdling agent goes away and also prevents the cheese getting stiff. Now, gather the corners of the muslin cloth into a bundle and squeeze out the excess water as much as you can. Hang the muslin cloth either in your kitchen cabinet or the kitchen sink tap. Leave it as such for about 2 hours, and the excess whey will drain completely. When the water is completely drained, remove the Paneer from the cloth and put it in a bowl. Make sure the Paneer does not dry out completely because it should be soft and moist. Cook for one whistle and then keep it in simmer for 10 more minutes. Once you open the cooker, you will see that the size of the Rasgulla would have doubled up. If you find difficulty in kneading and making balls or if your Paneer balls are soggy, dust little maida (more or less 1 tablespoon) and then knead to form balls. Adding maida is optional. You may not put so many Paneer balls into the cooker as it needs space to double up. Do not expose Paneer balls to air for a long period. It will dry out and once cooked, it will not absorb the syrup. Why is my Rasgulla not spongy? My syrup is too thick. When you have cooked the first batch of Rasgulla and found your syrup too thick or reduced in volume, add more water and little sugar to the syrup. When the sugar has dissolved completely and the water has boiled then add the second batch of Rasgulla and repeat the procedure. 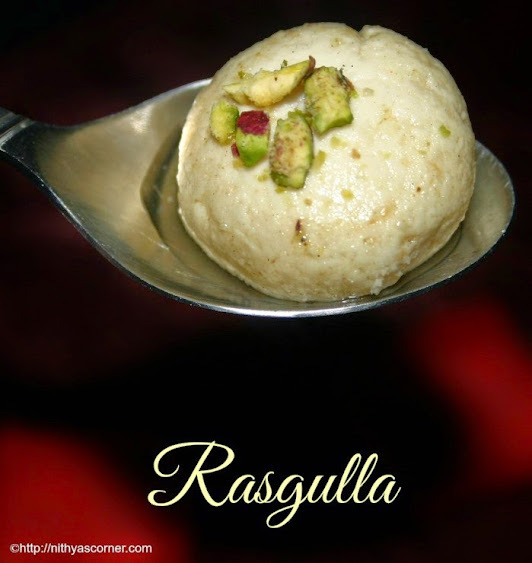 Yes, when Rasgulla is refrigerated, it would lose a little bit of softness. My Rasgulla is not smooth and pure white in color. 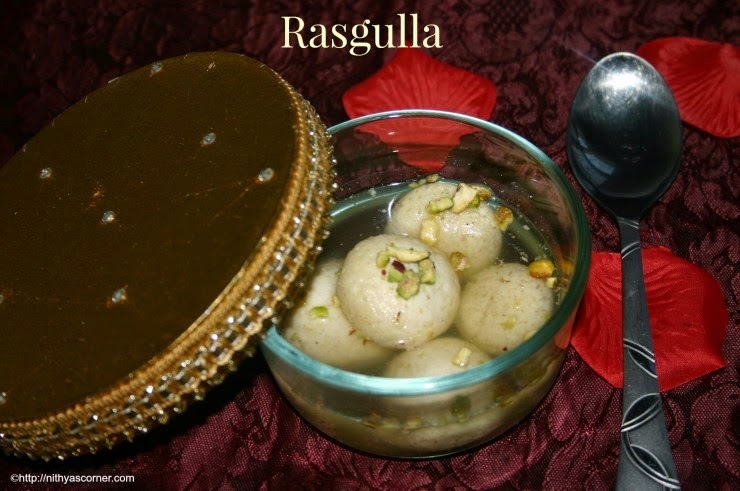 If you cook rasgulla more than the required time, there is a chance that it would lose its white color and smoothness. This entry was posted in Others and tagged Paneer, Rasgulla on November 22, 2014 by vikashbhardwaz.